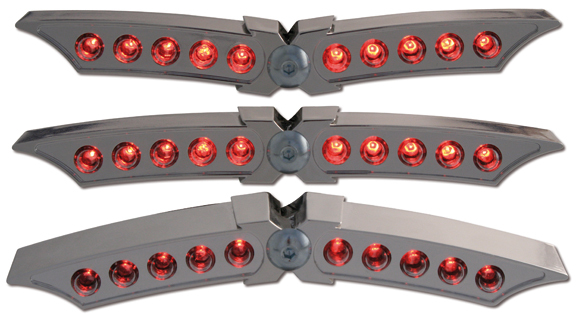 X-Wing Motorcycle LED Tail Lights can be replacements for the stock Harley lights and can be installed on any chopper, bobber and most custom motorcycles. They are not bolt-on replacements and installation will require some custom fitting and modifications, but these motorcycle LED tail lights will make your custom bike stand out, giving it a unique look. 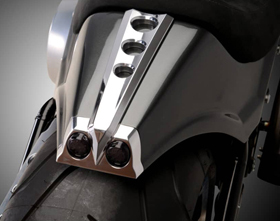 X-Wing LED lights for motorcycles feature a new innovative design which allows setting the wings at different angles for a total of 20 degrees and to mount it underneath fenders with different curving radiuses for a super clean look! X-Wing Motorcycle LED Tail Lights feature clear LED bulbs, which turn red when you brake or turn on the tail light and feature two brightness levels for run and brake light. Looks great combined with our Uranus Chrome Headlights with Mount. We also offer black tail lights for customers that prefer the “dark look”. Tail light housing is made of ABS plastic. Dimensions: width 5.40”, center height 0.63”, wing height 0.50″, depth 0.79”. Do they double as turn signals as well? 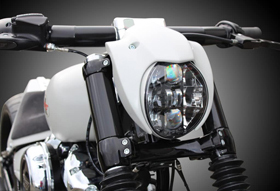 Our motorcycle LED tail lights are set up to run as running lights and brake ligths. I am not sure if you can modify the wiring on the LED board to add the turn signals function. I have a question about the x-wing taillights. How do they attached under the fender? Also, in the description it state replace any HD taillights, are these lights D.O.T. approved. Thanks. Normally customers adjust the X-Wing motorcycle LED tail light to follow the inside curve of the rear fender and then they glue it underneath it. They use two-part epoxy glues that bond plastic and metal. Other customers french the X-Wing motorcycle LED tail light inside their fender. Sorry, but none of our parts are DOT approved (like most aftermarket parts). 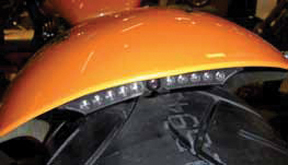 Hi, I’m interested in these lights for my 2012 Harley Iron 883. Will it be compatible? I don’t know much about wiring, will these come with instructions on how to do it? These are universal fit LED taillights, which you need to solder to your stock taillight wires. There are no special instructions. The shop where you normally go for service will be able to install them for you no problem. What are you asking for these taillights pricewise? How many wires? Does each side have it’s own lead? I’d like to use as turn signals. The X-Wing motorcycle LED taillight has only 3 wires (running tallight, brake light, ground). It cannot be used as turn signals.